Beautiful October started lovely, with yellow and red tones, photogenic grey skies, and new inspiration. I received the two new books I’ve been longing for since I first heard about their projects: Vegan by Food52 and Heidi’s Near and Far. These are probably the best things October has brought so far, besides the beautiful pigeons that started visiting me every day in the afternoon for a seed snack on my kitchen window sill. Like everything Food52, Vegan is a collection of simple recipes. 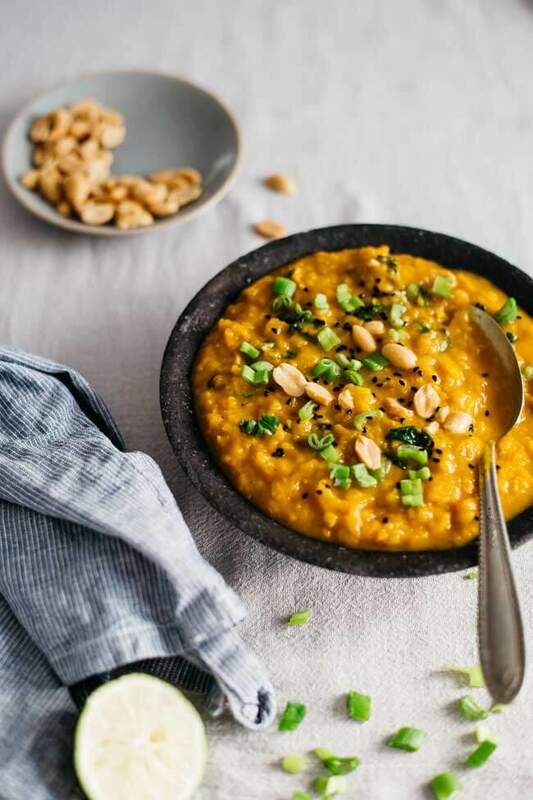 For people who are willing to work more healthy foods into their diet, these are plant-based, vegan recipes everyone can afford or prepare. Nothing fancy, just the ones you really need – real food with vibrant whole ingredients. 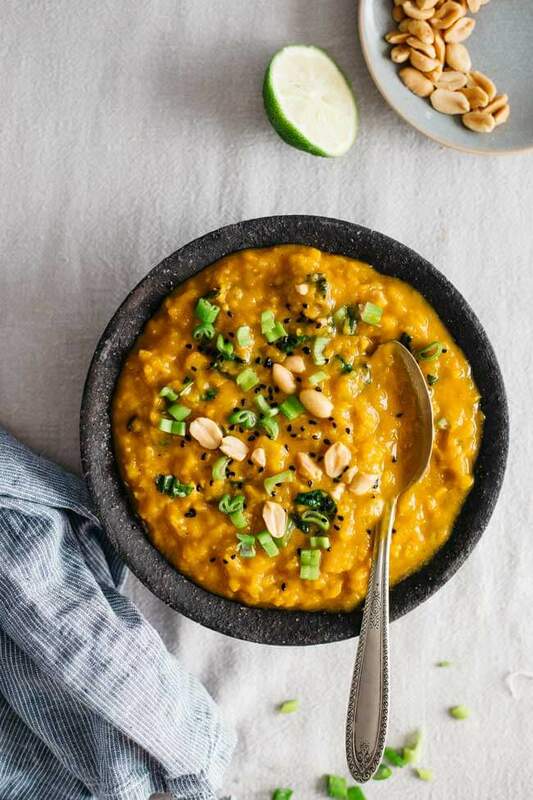 A good granola, a nourishing porridge, a creamy vegan soup, or a veggie hamburger that really stays together – you need to make these almost every week, but never have a really good recipe, and you always waste time browsing hundreds of Pinterest ideas to find a reliable one. Gena Hamshaw, certified nutritionist and the author of these recipes, had a great contribution to changing the way people think about food, both through her website and her New Veganism column on Food52. There are some vegan classics that everyone’s making these days, but there is always somebody that made them first or made them really balanced. The photos in Vegan are the perfect celebration of the recipes – simple and vibrant, with minimal styling, in the unmistakable style of Food52’s favorite photographer, James Ransom. The sweet potato and kale stew is definitely a hit that everyone’s heard about, and although there are hundreds of variations, Gena’s genius idea of adding peanut butter to infuse creaminess turns this recipe into my fall favorite. This stew is not only hearty and comforting, but also a great way to nurture your digestive system during the cold season. 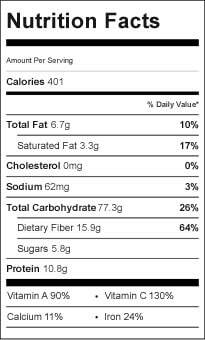 It contains a great deal of antioxidants, especially betacarotene, fiber, potassium, and healthy monounsaturated fats. Ginger soothes the digestive system, while turmeric reduces inflammation and protects your body’s cells against oxidative stress. The taste is sweet and sour, the texture is velvety, it’s warm and smells delicious – can you think of a better treat for a rainy day? 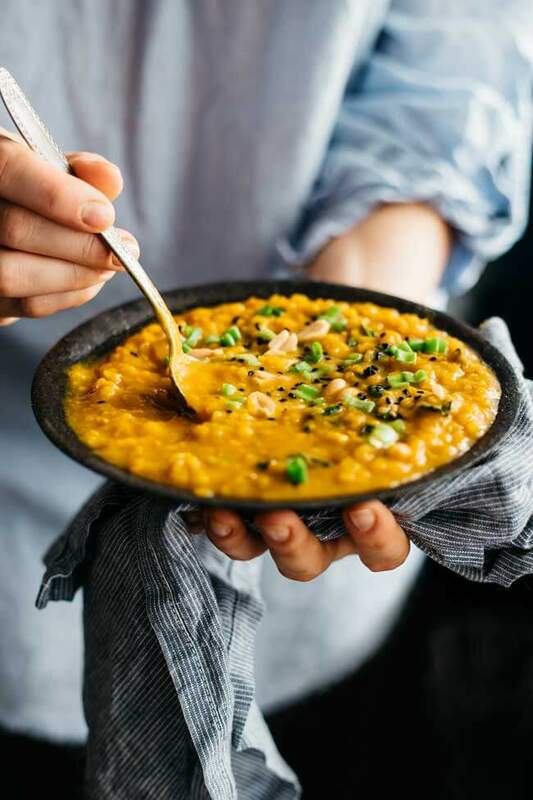 A creamy sweet potato stew, loaded with antioxidants, fiber and healthy fats for nurturing your body cells and warm you up in rainy autumn days. Heat the coconut oil into a medium pot over medium heat. Add the onion and fry until translucent. Add the garlic and ginger, and sautee for a minute or two, until the ginger starts to release its flavor. Add sweet potatoes, lentils and spices, stir to combine, then add the vegetable broth and tomatoes, bring to boil and let simmer over low heat for 30 minutes, stirring occasionally. Add the peanut butter and stir to incorporate. Transfer the stew into the food processor and pulse one time to half-puree it, or use an immersion blender instead. The idea is to still have some visible sweet potato chunks. Add the kale leaves and cook for five more minutes. Season with freshly ground black pepper, and serve garnished with green onions, peanuts and black sesame. this is just so comforting and looks like the prefect meatless fall meal!! YUM!! Hi! I’m making this recipe right now…it doesn’t say when to add the tomatoes!! I added them w with the vegetable stock…I hope that was right. I just found your blog and am so excited about it. I need to eat so much healthier, but haven’t found anything even remotely attractive. This food looks amazing. Emanuelle, the best changes are made step by step, and I’m so happy my blog is among the ones influencing your diet in a healthier way 🙂 Let me know how this stew turns out, I found it really delicious! I just discovered your lovely blog. Your photos are beautiful. And your recipes sound perfectly aligned with my tastebuds: wholesome, vegetable based, and full of flavor. Happy to have found you! I’ve made this yummy recipe before from Food52’s site and loved it too. I’ve heard such good things about this new cookbook, I’m tempted to add it to my collection. Near and Far is another on my list. Both Gena and Heidi are so lovely and I’m sure their books are both amazing! 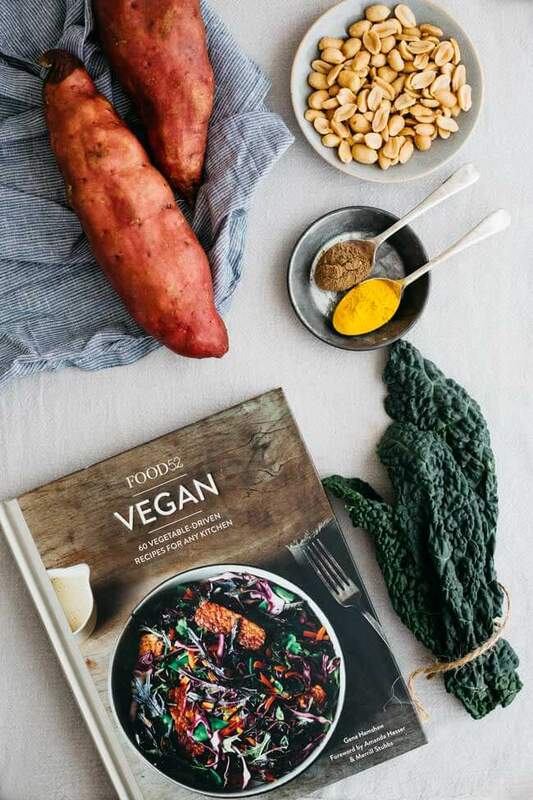 Hi Christine, Vegan book is a must have for the healthy-diet-beginners, there are a lot of handy how-to’s, from vegan milk to different spices. Heidi’s is a book to enjoy on a Sunday afternoon, next to a cup of good coffee or tea – it is so inspiring and has amazing photos, Heidi is so talented, I just love her!